Made in 1976 by Arje Griegst, and commissioned by Margrethe herself, this piece ticks all the “unusual tiara” boxes: it’s made of gold, it is incredibly modern, and it actually attaches at the back of the wearer’s head. In the detail photo above, you can see that a comb sinks into the wearer’s hair, allowing the poppies to trail forward toward the forehead. The effect means that the flowers are scattered across the head, rather than bunching together in the wreath shape we’re more accustomed to from floral tiaras. The flowers are studded with gems — including aquamarines, moonstones, and opals — and, well, insects. Nature! The piece is a part of a set that also features coordinating earrings and a necklace. The individual pieces of the ornament are also detachable, which means that they can be worn scattered throughout the hair. 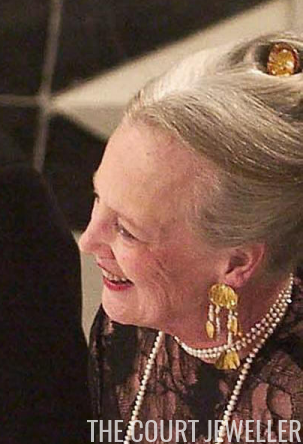 Above, you can see one of them peeking out of Margrethe's chignon at Frederik and Mary's engagement dinner in 2003. Ultimately, if there’s a more reviled piece in the tiara world than this one, I can’t think what it would be. But somehow it’s just about perfect for the flamboyant and theatrical Danish queen — after all, this is the woman who illustrated a Danish edition of The Lord of the Rings. Even so, I’m skeptical that this piece will have staying power. Can you imagine the next Danish queen — Crown Princess Mary — wearing this one? I’m not sure I can picture her wearing it as-is. But the poppies here are detachable, and perhaps she might be able to use them in a different arrangement.